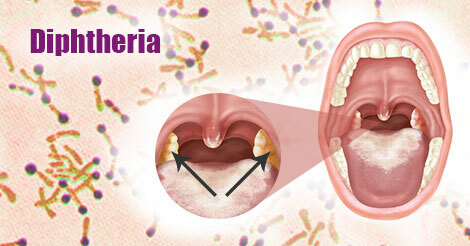 Diphtheria is an acute infectious disease of the upper respiratory tract. It may also affect the skin (cutaneous diphtheria). It is caused by the diphetheria toxin produced by corynebacterium diphtheriae or corynebacterium ulcerans. The most characteristic feature of the affection of the upper respiratory tract is membranous pharyngitis – the toxin is responsible for the formation of a grayish- yellowish membrane ‘psuedo- membrane’ formed on the tonsils, pharynx or larynx. Pseudo membrane may cause respiratory obstruction. Enlarged lymph nodes in the neck (cervical nodes), along with soft tissue oedema (swelling), gives a ‘bull neck’ appearance. Diphtheria is a disease that is seen more commonly in developing countries.If left untreated, the disease could be fatal. Diphtheria is a rare disease in most developed countries thanks mainly to the routine vaccination of children. Some of the more recent epidemics seen in the countries that constituted the erstwhile Soviet Union, was largely due to decreasing immunization coverage among infants and children, which may have been due to the non–availability of the vaccine in these areas. Diphtheria continues to make its presence felt in India. It is still endemic to India. The available retrospective data indicates a declining trend of the occurrence of diphtheria. In 1995, about 1,257 cases of diphtheria were reported.